This is one of many challenges highlighted by fifteen aviation associations – including Airlines for Europe (A4E), Airports Council International Europe (ACI EUROPE), Air Traffic Controllers European Unions Coordination (ATCEUC), Civil Air Navigation Services Organisation (CANSO), European Business Aviation Association (EBAA) and the European Cockpit Association (ECA) – as part of a new campaign called “We are all one in the sky” to facilitate the integration of drones in very low-level airspace (i.e. below 500 ft) and preserve the high level of safety in the entire European airspace. The campaign has been formed to accelerate the implementation of the following measures: Extensive public awareness campaign, Mandatory training and certificate/license relevant to operations, Airport protection from drone intrusions, incident reporting, increased effectiveness of enforcement, improved situational awareness of all manned aircraft and the introduction of traffic management for drones – UTM/U-Space – along with further research. “Our common and primary concern are drones flying at low altitudes near airports and helicopter landing sites that could threaten aircraft taking off or landing,” says a campaign statement. “Regulation must be in place for countermeasures and a safety case must be produced to determine the level of ‘power’ given to the security forces. It is essential to clearly define the roles and responsibilities of each stakeholder (e.g. airports, air navigation service providers and authorities) with regards to the detection, identification and neutralisation of drones. The campaign also wants to develop a no-fault drone incident reporting system throughout Europe. And the campaign also calls for additional research to take place on essential areas like contingency procedures, geo-fencing, surveillance, ATM-drone pilot communication and impact of collisions between drones and all types of manned aircraft. 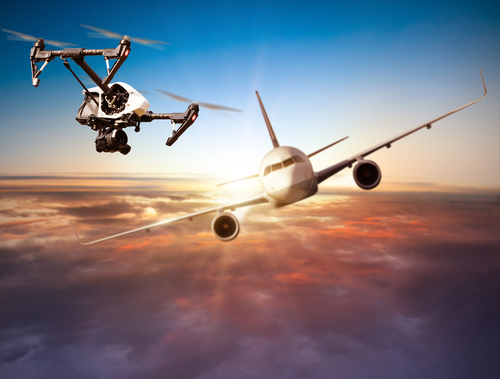 The market for UAV Traffic Management Services – 2019-2023.